The bird problem faced by commercial office buildings, factories and warehouses has become a point of concern for many. Bird droppings are acidic and are known to transfer diseases and cause structural damage in the long run. In an effort to curb this problem, PCI has stepped in to provide humane solutions. PCI’s range of unique products serves to stop birds from entering potential nesting or landing zones. Netting Solutions – to prevent birds from getting into nooks and crannies to nest. 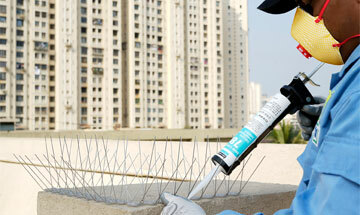 Bird Spike System – upward pointed spikes prevent birds from landing on platforms and ledges. Birdwire – tensioned stainless steel wires used to prevent birds from landing on barriers. BirdPro® Trak system – highly discreet track system that conditions the birds to stay away from that particular area. Based on the severity of the problem, PCI’s experts will devise a program that utilises one or a combination of the many products in the BirdPro® service. These are specifically chosen and strategically used to deter the birds from your commercial complex, office or warehouse. PCI offers customizable systems according to the client’s requirements, based on the level of infestation. With the use of humane products and technology, and keeping the aesthetics of the structure intact, PCI has designed BirdPro® to be the best anti-bird solution in the market. BirdPro® is a unique one-stop solution for all bird related problems.